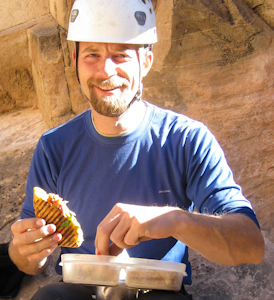 Food - It is nearly impossible to enjoy rock climbing when you're hungry. I always ask clients to "bring more food than you think you can eat." That way, when you discover the ravenous appetite climbing can create, you can eat well beyond your normal daily intake. Don't worry, you'll burn the calories! Water - I used to suggest one liter, but on hot summer days, one liter isn't close to enough, especially if you end up exposed to direct sunlight for any length of time. In Spring or Fall, bring two liters per person to ensure good hydration throughout the day; during Summer, bring three liters and hope you don't need to drink it all. Sunscreen - You might plan to climb in the shade, but you never know when a group of Scouts will be climbing at your 1st, 2nd, and 3rd choice crags. So always bring sunscreen, just in case. This especially applies to those gorgeous November days, when the sun grants us perfect temperatures through leaf-bare trees... these are the days you can fry your skin to a crisp, even though you're not hot. I like Naked Bee sunscreen, because it doesn't give me cancer AND it smells pretty nice. Bug Dope - Depends on the year. This year, the skeeters are virtually non-existent. But in a wet year after a big hatch, you are a good meal to a flying swarm. Nice to have a small vial of bug dope in the pack, just in case. Shades - Sunglasses aren't strictly necessary, but there's a chance you'll end up belaying a climber for 30 - 60 minutes, staring right up into the sun. Make it easier on yourself by dimming that big fireball. Pants, tights, or long shorts - You might look good in short shorts, but you won't feel good with a harness on top of them. Ensure your own climbing comfort by wearing shorts with at least an 5" inseam or more. That way, the harness leg loops will stay on top of the fabric and won't rub against your skin. Pants are a no-brainer, but sometimes it's too hot for the long stuff. Flexible, breathable layers - Every outdoor enthusiast wears layers to prepare for changing temperatures. By wearing a modular systems of t-shirt, long-sleeve shirt, thin fleece, thick fleece/sweater, warm jacket (and possibly a rain shell), you are ready for anything. Use common sense, of course... You won't need all those layers in July. But you might be surprise how many you might appreciate on a late September morning. In addition to temperature modulation, your layers must be able to stretch when you move your body. Which is why stretchy things like yoga pants, Under Armor, or sweatpants are better for climbing than blue jeans. Backpack - Another essential outdoor tool. A decent backpack (at least 1500 cubic inches) allows you to bring personal and group gear up to the climbing crag. Your backpack should have padded shoulder straps (not thin rope or cord) and compartments that zip shut. Decent close-toes shoes - When hiking or scrambling across the hard, sharp scree at Devils Lake, you really need good close-toes shoes to prevent cutting your toes and/or ankles and getting debris inside your footbed. Sandals are NOT appropriate. I speak from personal experience! Headlamp - This is more important during shorter Spring/Fall days, but it's never a bad idea to have a headlamp handy. Sometimes we get carried away with climbing fun, and a headlamp allows for a safe hike out if darkness has fallen. Headlamps are also great for helping folks know where you are if you've been injured and can't make it back to the trailhead. Camera - Not essential, but when you're in a place as beautiful as Devils Lake, you may want to capture some memories. Patience - For yourself and others. Optional, but it really helps everyone have more fun.